In the early hours of Feb. 28, 2012, Julius Adams left the Trump Plaza Casino and started down the Boardwalk Hall tunnel in Atlantic City. After a night of gambling and drinking, it was time to go home. A few blocks away from the casino, he found himself surrounded by a group of Atlantic City police officers. Adams claims in a federal lawsuit he was detained, beaten and held at gunpoint by the officers. While he was handcuffed, he alleges, officers sicced two police dogs on him. Adams claims the attack, which left him “incapacitated” for a month and with permanent injuries, was payback for an internal affairs complaint he filed a year earlier against an officer. He filed another complaint after the 2012 incident, but the department said his claim of excessive force was unfounded. Adams eventually pleaded guilty to inflicting harm on a law enforcement animal. The incident, which will be at the center of a civil trial set for January, came as Atlantic City’s use-of-force rate was soaring above every department in the state. Atlantic City police officers used painful holds, punches, kicks and other types of force to subdue suspects 2,854 times from 2012 through 2016, according to The Force Report, a 16-month investigation by NJ Advance Media for NJ.com. The investigation found New Jersey’s system for tracking police force is broken, with no statewide collection or analysis of data, little oversight by state officials and no standard practices among local departments. The news organization collected 72,677 use-of-force reports covering every municipal police department and the State Police. The results, available at NJ.com/force, revealed police across the state used force in about 3 percent of all arrests. Officers in Atlantic City, where 40 percent of residents live in poverty amid the 30 million visitors to its casinos and beaches every year, used force in 11 percent of arrests. The department’s total number of uses of force dropped significantly in 2014 to 529, when a report from the state Attorney General’s Office found a small number of officers accounted for an unusually high number of incidents. The report was initiated by the Atlantic County Prosecutor’s Office after several high-profile incidents of force, including a K-9 attack on a young man. An NJ Advance Media review of lawsuits, court documents and depositions of police officials, as well as interviews with a half-dozen current and former officers, points to a department that often seemed indifferent to officers with violent tendencies, leaving them on the street without repercussions. Many were promoted or appointed to prestigious roles. About 11 percent of officers used force 21 or more times, more than five times the statewide average. Only 252 officers in the entire state used that much force. So Atlantic City, with about 1.4 percent of all New Jersey officers on its force, accounted for 14 percent of the officers statewide using force the most. One Atlantic City officer, Scott Sendrick, reported using force 62 times in five years, the most in the state during that period among 17,369 officers who appear in The Force Report. Between 2007 and 2014, the department faced 570 excessive force complaints. Only two — or about 0.35 percent — were sustained by department investigators. The average number of cases found to have merit for departments the size of Atlantic City is 12 percent, according to U.S. Justice Department data. Atlantic City officers have been named in at least 24 excessive force lawsuits over the past decade, costing taxpayers nearly $6.5 million. And one officer named in excessive force lawsuits that resulted in $4.5 million in settlements never had an excessive force complaint against him sustained and never was disciplined until he was arrested by federal authorities in October. How did these numbers climb so high? Why did no one do anything to bring officers back in line? Who was keeping track? The only insight into what top authorities were thinking is found in depositions filed when the department was sued. The police chief declined to comment for this story. So did police union president Matt Rogers. The city’s mayor did not return messages seeking comment. Neither did city council president Marty Small. No one in a position of authority within the department or city would comment on these findings. Atlantic City is a town of dreams and of destitution. Walk a block or two from the gleaming, sky-high casinos lining the shoreline and you find a city wracked with poverty. In a state where about 10.7 percent of residents live below the poverty line, 40.6 percent of Atlantic City residents do the same, according to the Census Bureau. The poverty level, which has climbed in recent years, coincides with an economic collapse in the city. In 2006, gross gaming revenues in the city’s casino declined “significantly,” according to a 2018 report conducted by special counsel Jim Johnson on behalf of Gov. Phil Murphy. The city’s taxable base, propped up mostly by casinos, plummeted from $20.6 billion in 2010 to $7.3 billion in 2015. The city narrowly avoided going bankrupt in 2015 by relying on a significant increase in state aid and deferring payment to the state’s pension and health benefit plans, according to the Johnson report. By 2016, then-Gov. Chris Christie signed a bill to place crumbling cities under state supervision until they are stabilized. Today, Atlantic City finds itself in an increasingly complex situation. How does the city help residents while also revving up the casino industry, its economic engine? While politicians see promise with two recent casino openings and Stockton University’s new campus, a walk down Atlantic City’s ravaged business district and through its hidden neighborhoods shows much of the city still waiting for a rebirth. Add in millions of tourists a year who can make or lose a fortune at any minute of the day and you’ve got a combination of factors that makes Atlantic City like no other town in New Jersey, and few in the United States. While that 2014 report on the department’s force rate explained the challenges facing officers in Atlantic City, it didn’t say whether the patterns it studied were inappropriate. That was up to the department to decide. The “watershed moment” for the Atlantic City police department came after a 2013 K-9 attack and the ensuing excessive force lawsuit the city settled for $3 million, said former Sgt. Steve Cupani, who retired in 2014. The settlement pressured officers to scale back aggressive tactics, Cupani said. It also played a role in the attorney general’s office analyzing the department’s use of force. The year of that attack, Atlantic City officers were on track to use force more than any other in the five years for which NJ Advance Media collected data. The number of incidents where police reported using force on suspects peaked at 825, declining steadily to 318 in 2016. But during that time, the number of arrests the department reported to the FBI also dropped 55 percent. While the overall number of uses of force plummeted, the rate at which officers used it didn’t change much. In 2013, officers reported using force 825 times and used it in about 13.6 percent of all arrests. In 2016, overall uses of force fell to 316, but because of the drop in arrests, officers still used force in 11.1 percent of all arrests. Even at its lowest, Atlantic City officers were still using force at a rate three times the state average. The department used force at the second-highest rate of any municipal police department in the state, behind only Maplewood. The department’s use-of-force rate doesn’t tell the full story, but it’s a starting point, said Matthew J. Hickman, an associate professor and chair of Seattle University’s Criminal Justice Department. He described the resort town’s numbers as striking. Police officials credited the decline in force incidents to a “revamped” internal affairs unit and the use of body cameras, two changes that occurred when Henry White became the department’s chief in 2013, according to a deposition. White had been deputy chief for eight years. “The things that I have put together for the entire department has protected our citizens of Atlantic City from rogue (officers) and misconduct from the Atlantic City police department,” White said in the 2016 deposition. One change was a functioning electronic early warning system. Though New Jersey doesn’t require police departments to have a system to track use-of-force trends, a national accreditation process does. The department in 2010 and 2012 revised its internal affairs policy during the accreditation process to say it used an electronic early warning system, but it didn’t implement it until 2015. The now-up-and-running system has a “process in place that involves the officer, his chain of command, our internal affairs, professional standards, to address and to look at trends,” White said in his deposition. Though the department failed to swiftly implement the electronic system, White said in his deposition, it previously used a manual early warning system, filling out index cards and placing them in a file. Yet multiple officers said under oath they weren’t notified when they triggered a system meant to alert bosses to potential problems. Not until years later did they learn they were flagged — repeatedly. Officer Michael Oldroyd used force 50 times from 2012 to 2016. But he wasn’t told about his high rate until February 2014, he said in a deposition. His command staff told him they did not give credence to internal affairs complaints against him and to continue policing how he was. 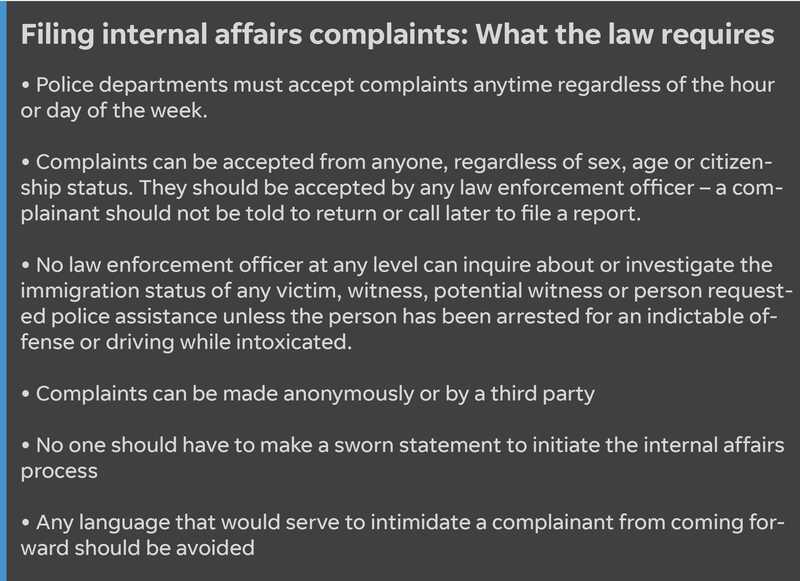 Oldroyd tallied 91 internal affairs complaints — 46 of which were for excessive force — in a 14-year stretch on the job. That approach is “completely incorrect as management practice,” said Jon Shane, a retired Newark police captain who teaches at John Jay College of Criminal Justice in New York and was previously hired by a plaintiff in an excessive force lawsuit to analyze Atlantic City’s internal affairs unit. Atlantic City’s problems aren’t new. An NJ Advance Media review of court files and other public records found officers over the past two decades have been criminally accused of assault, stealing from suspects and in one case dognapping a puppy. Because of a protect-the-shield mentality, the department gets “away with abuse of power, misconduct, domestic violence, failure on drug test and everything else,” a police officer wrote to Attorney General Gurbir Grewal earlier this year. NJ Advance Media obtained a copy of the letter from a community activist. “It’s out of control,” the officer wrote. Richard Rivera, a former West New York officer and police expert who was hired by the plaintiff in an excessive force lawsuit to review Atlantic City’s police practices, said a good internal affairs unit serves as the “eyes and ears” of a department, identifying officers with performance troubles before they bubble over into excessive force complaints and lawsuits. For years, Rivera said, Atlantic City’s internal investigators purposefully ignored problems, finding merit in less than 0.5 percent of excessive force complaints. In one lawsuit, Rivera examined 83 internal affairs files of Sgt. Frank Timek and officer Sterling Wheaten, and determined investigators had “crafted their investigation and findings” to be more favorable to officers. Timek, a nearly 20-year veteran, accumulated 63 internal affairs complaints — 43 of them for excessive force — between May 2001 and August 2014, as well as being named in 11 excessive force lawsuits, according to court documents. During this time period, he became a K-9 handler and then was promoted to sergeant, just three months after he allegedly sicced his dog on Julius Adams. “If somebody goes to prison, whether state prison or federal prison, they are going to have Internal Affairs to thank for that for not correcting these things earlier,” Shane said. After being indicted for his role in the attack, Wheaten is now suspended without pay. Rivera found internal affairs investigators frequently failed to follow attorney general guidelines. In 21 cases of excessive force complaints naming Wheaten, he was never interviewed by internal investigators. During a 2016 deposition, White said that the internal affairs numbers “didn’t look good.” Still, he said, he had not investigated why so few cases were substantiated and acknowledged the low sustain rate may have led the public to believe the police department was not taking internal affairs complaints seriously. 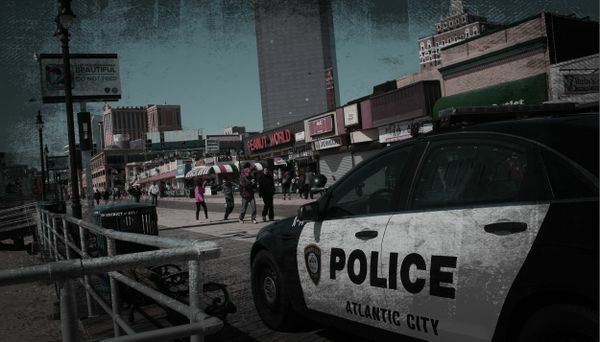 Multiple police experts and attorneys said one reason for Atlantic City’s dramatic drop in excessive force complaints could be attributed to the 0.35 percent sustain rate from 2007 to 2014. Residents don’t want to file complaints if they don’t think they’ll be taken seriously, they said. Defense attorneys and the state Public Defender’s Office say the unprecedented release of police use-of-force data in New Jersey could significantly bolster the rights of defendants who for years have had the odds stacked against them in court. In the wake of The Force Report, a 16-month investigation of police use of force by NJ Advance Media for NJ.com, the attorneys said they have been strategizing over how they could use the data to gain more access to police personnel records in their cases. The investigation found that while the majority of police officers in the state barely used force at all, many departments had individuals who did so far more than their peers. The data revealed that multiple officers who were charged with brutalizing suspects and other types of misconduct would have raised red flags had a system been in place to track use of force trends. The entire database is now available to the public at NJ.com/force. The attorneys said that accessing police records can be difficult during discovery. They said cannot request a police officer’s entire disciplinary record when they can’t present proof that there’s anything relevant to the case in it. With the newly released data, they said they may now have a basis to request and receive more documentation. Bittner-Kean said the defense attorney association plans to discuss The Force Report at its next board meeting and brainstorm how to use it in court. Sellitti said attorneys working for the Public Defender’s office already have been combing through the database, and the office has been crackling with excitement at the possibilities it presents. “This is something we’ve been discussing for a long time, and (NJ Advance Media) just stepped on the accelerator for everyone,” she said. Sellitti also believes the newly released use-of-force data could prove valuable in other aspects of criminal litigation, such as reinforcing the prosecution’s requirement to turn over evidence that may be favorable to the defense. “It adds some teeth to what we’re asking prosecutors for,” she said. Matthew Troiano, a defense attorney who spent years as a prosecutor for Hudson and Morris counties, said the database removed barriers to learning about an officer’s history. That could especially impact cases where an officer’s testimony conflicted with the testimony of someone he or she had arrested, Troiano said, because the differing accounts could be more easily compared to that cop’s past arrests. “In that type of situation, it’d be extremely helpful,” Troiano said. Terence Jones, a civil rights investigator, said he hopes The Force Report will prompt state Attorney General Gurbir Grewal to push for more transparency in policing data and enact reforms that will allow for greater accountability. Hours after the project was released, Grewal called it “nothing short of incredible” and promised to propose changes to the system. On Wednesday, he issued a rare joint statement with every leading law enforcement official in the state conceding they had failed to accurately track police force and setting forth reforms, including standardized electronic reporting. We are continuing to make this dataset better. The numbers in this story were last updated Dec. 12, 2018. You have never seen anything like this in New Jersey. For the first time, you can now search to see how often your local police officers use any kind of force — from punches and kicks to baton blows and shootings — against someone. See how they compare against other officers in their department, as well as officers in other departments across the state. And there are some huge disparities depending on where you live. What is police use of force? Perhaps the single greatest power granted a police officer is the legal authority to use force against another person. It is a normal part of policing, whether it’s twisting someone’s arm behind their back or firing a gun. Check out our A-Z explanation of every kind of police force. What is The Force Report? A 16-month investigation into New Jersey’s broken system for tracking and stopping overly aggressive police officers before they cause unnecessary injuries and costly lawsuits. NJ Advance Media reporters filed 506 public records requests and collected 72,607 use-of-force forms covering 2012 through 2016, the most recent full year available. Read the Frequently Asked Questions about The Force Report. New Jersey’s system for tracking police force is broken, with no statewide collection or analysis of data, little oversight by state officials and no standard practices among local departments. While using force is a normal and necessary part of policing, NJ Advance Media found glaring disparities across the state that warrant review. Whenever police use force, the stakes are high. At least 15,000 people were injured by police from 2012 through 2016. Statewide, a black person was more than three times more likely to face police force than someone who is white. The system for reporting use of force by police is a mess. New Jersey fails to monitor trends to flag officers who use disproportionately high amounts of force. Read the full story about the investigation’s major findings. In response to the investigation, state Attorney General Gurbir Grewal conceded the entire system for tracking police use of force was broken and promised a major overhaul. “The reporting that you’ve done and the hoops you had to jump through to get this data are completely unnecessary,” Grewal said. “It shouldn’t have taken you a year and 500 OPRA requests, and we’re committed to making this data more available, not just to the media but to the public. 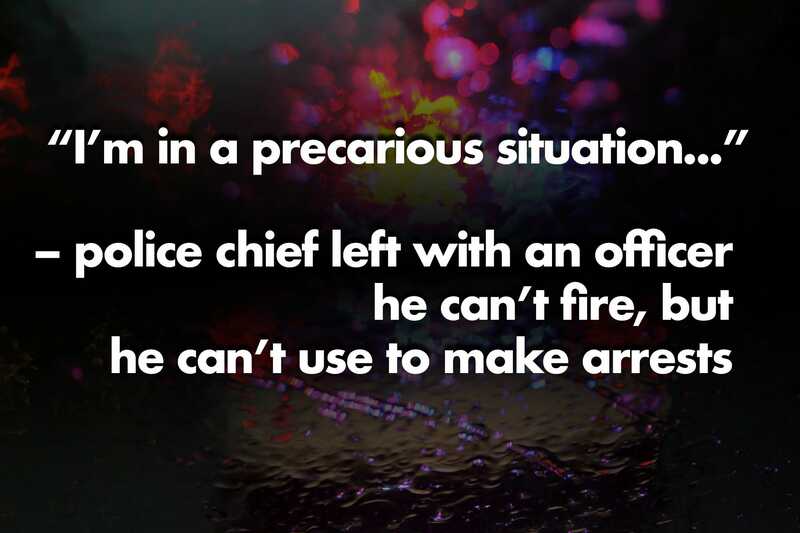 Read more about how N.J. failed to stop potentially abusive police officers. Using force can inflict significant and lasting harm on a person. A failure to properly oversee police use of force can result in overly aggressive officers unnecessarily injuring or killing people. Besides the human toll, such actions can cost taxpayers a lot of money in lawsuits. Read more about people who claimed they were victims of excessive force. Is ‘force’ the same thing as ‘excessive force’? No. Using force is a normal and necessary part of policing to protect both the public and the officer. But experts agree it should be closely monitored in order to intervene with officers who may be pushing the boundaries of what’s acceptable or who are being outright excessive. Read our detailed methodology about how we did this investigation. What will I find in the database? The database covers uses of force from 2012 through 2016 for every municipal police officer and State Police trooper. It includes detailed breakdowns on race of subjects and officers, types of force used, reasons for using force, injuries and more. And it’s all available for the public’s use now on nj.com/force. Enter the name of your local department or any officer for their statistics and how they compare. We want to hear from you about stories or trends you find in the database, or other issues related to police use of force that you think should be investigated. You can reach our team of reporters directly at forcereport@njadvancemedia.com or check out our many ways to securely submit a tip at nj.com/tips. EDISON – Five township police were indicted Friday by a grand jury on multiple charges including official misconduct, participating in a pattern of official misconduct, and theft, according to a statement from Middlesex County Prosecutor Andrew C. Carey. The indictment was handed up in New Brunswick following an investigation by the Edison Police Department’s – Internal Affairs Unit and the Middlesex County Prosecutor’s Office. The case was presented to the grand jury by Middlesex County Assistant Prosecutor Christine D’Elia. The investigation determined that between Nov. 14, 2016, and May 7, 2018, the Edison Police Officers were getting paid for extra-duty jobs which they were not present for. These extra-duty, or “side jobs,” were in addition to the regular hours which they as members of the Edison Police Department were assigned to work, the statement said. “While the Edison Police Department has recently taken important steps to ensure that the extra-duty jobs are now assigned and completed in a legitimate fashion, this investigation is very much active and continuing,” Carey said in the statement. 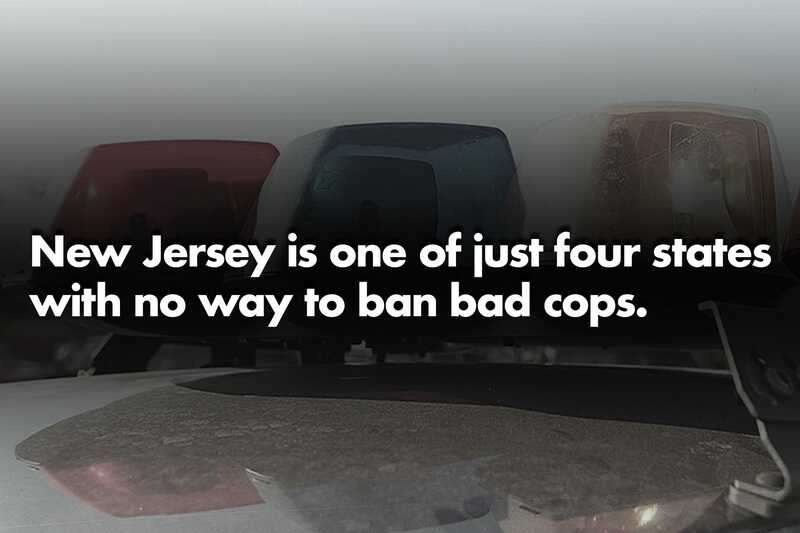 New Jersey stands nearly alone in the nation for refusing to ban bad cops. The state fails to track officers with known histories of bias or lies. 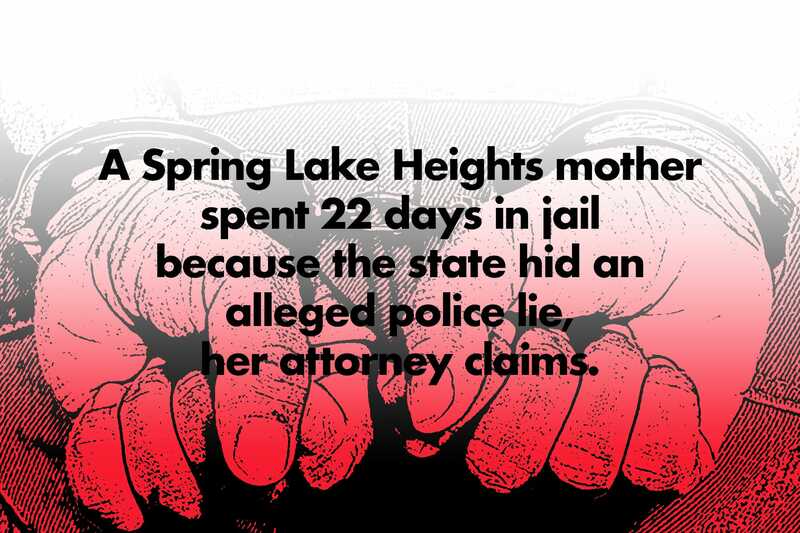 Eileen Cassidy, a Spring Lake Heights mother of three, spent 22 days in jail because New Jersey hid a State Police sergeant’s misconduct for nearly a year, her attorney argued. She pleaded guilty in 2016 to a drunken driving charge without knowing that the breath-testing machine used in her case was unreliable, her attorney claimed in a brief filed in June before the state Supreme Court. A State Police sergeant responsible for certifying breath-testing machines as accurate was indicted by a state grand jury on charges he falsified documents to show a machine had been properly tested when he had actually skipped a step Cassidy’s attorney called “extremely vital” in his brief. The sergeant pleaded not guilty and his case is pending. The alleged fabrication throws into doubt the validity of breath samples in more than 20,000 DWI cases involving machines certified by the sergeant – including Cassidy’s. The state attorney general’s office knew about the skipped steps but failed to tell Cassidy and others about the problem for 11 months before Cassidy pleaded guilty, Cassidy’s lawyer claims. The state has argued that the step improves confidence in the tests, but doesn’t affect scientific reliability. The breath testing machine debacle highlights the damage done to cases involving thousands of defendants when New Jersey fails to catch police misconduct or tell the public about bad officers. In most other states, an officer who breaks a rule can be banned from wearing a badge, some even without a criminal conviction. But New Jersey is different. It stands nearly alone in the nation for its lack of state oversight of police officers. New Jersey is one of just four states that does not license police officers, a basic safeguard used nationwide to ensure bad cops don’t skirt the rules or move from town to town. Licensing is a practice common to dozens of other professions, from doctors to massage therapists, and even other public employees, such as municipal finance officers. Licensing helps ensure professional standards are uniform, upheld and bad actors are banned. Yet in New Jersey, the police oversight system is in such disarray that officials cannot track a wayward officer’s untoward conduct. Moreover, the state has no clear rules for when – or even if – a problem cop’s past has to be disclosed to those he or she arrests. Next time you’re in a traffic stop, a cop previously accused of dishonesty can arrest you, but there will likely be no way to know about his past, the Asbury Park Press and USA TODAY NETWORK New Jersey found. Dozens arrested by a cop a prosecutor’s office thought to be on desk duty – At least 43 people have been arrested by a Manchester officer after his town fired him – though he was later reinstated – and Ocean County Prosecutor’s Office told a court he would “undermine confidence” in prosecutions. A court, however, brushed off the prosecutor’s claim and found in favor of the officer in all but one issue. Top officials in the prosecutor’s office said they thought the officer was not on patrol until the Network showed them he was making arrests. $1.9 million in police salaries keeps 20 questionable cops on duty – Eight cops known to have been untruthful, a cop who made bigoted social media posts and another accused of trying to fix a ticket for his cousin are among 20 officers still on duty and collecting salaries and benefits. $1.6 million to settle claim after beating and cover-up – In June, Bloomfield agreed to a $1.6 million settlement of allegations related to an incident in which a man was beaten during a 2012 traffic stop and two cops falsified police reports. Former officers Sean Courter and Orlando Trinidad are still in prison serving a five-year sentence after they were convicted of crimes connected to that incident. Claims of police abuse cost New Jersey taxpayers more than $51 million since 2010, the Network found in a review of lawsuit settlements. That includes 24 deaths and 136 injuries. New Jersey can’t ban a bad officer in the way a rogue lawyer is disbarred. Officers in Pennsylvania and Florida, for example, can lose their licenses for less than criminal activity, like lying on an application. Lists of officers banned from serving in those two states are publicly accessible. The Garden State is now one of four without a way to ban bad cops – Hawaii passed a police oversight overhaul in July. “There’s a lot of professions that are licensed to a minimum standard and I think law enforcement officers should be held to a minimum standard of conduct and job performance,” Hawaii Rep. Scott Y. Nishimoto said. One of the nation’s top police standards groups – run by cops for cops – recommends police officers be certified and tracked the same way New Jersey licenses dozens of other professions. The International Association of Directors of Law Enforcement Standards and Training based in Idaho maintains a national database of more than 25,000 officer decertifications, intended to stop bad officers from jumping state lines to find new jobs in policing. With no system to ban bad cops, New Jersey can’t contribute to that list. Protecting the Shield: Three arrests — and still on the police force. The Network found that while state law bans convicted criminals from wearing a badge, cops who faced allegations in court as serious as official misconduct and witness tampering were able to secure deals that kept them on duty. In one case, a cop who agreed as part of a court sentence to never again work police or fire jobs then served as a volunteer firefighter and elected fire commissioner. Based on a series of court decisions over decades, prosecutors have a duty to tell defense attorneys if a police officer has a tainted past – a lie here, a bad report there. That way, the logic goes, a defense lawyer can point out to a jury if an officer has a history of being untruthful. It’s sometimes called “Brady” material, named after a 1963 U.S. Supreme Court ruling. New Jersey has no clear rules, however, that outline what prosecutors need to give up about an officer’s checkered past. A Network review of all 21 counties found that 17 don’t have a policy addressing the issue. Nineteen have no list of troubled officers. Failing to make the right disclosures undermines a defendant’s right to fair treatment in court and can lead to complicated appeals. 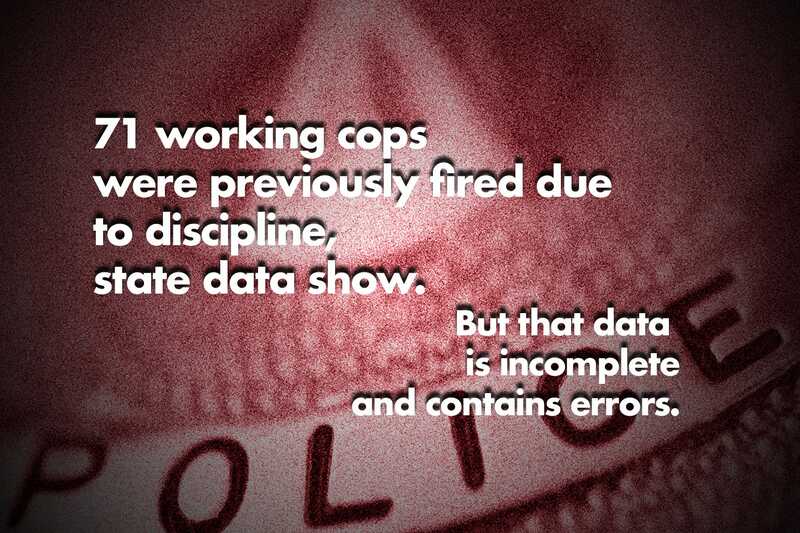 The best available data on police employment histories is limited and flawed. Seventy-one working officers were previously removed from public safety jobs due to discipline, according to a review of New Jersey’s Civil Service Commission public employee records. But the data only cover about a quarter of the public employees in the state. And in at least 22 cases, the Network found the data conflicted with municipal employment records or information about an officer’s employment history provided by police officers or chiefs. In at least one case, sloppy coding was the cause for conflicting employment records. In another case, an officer’s history wasn’t accurately reflected in the data and applications filed by the officer revealed he didn’t disclose a past firing to one employer. None of the 71 officers appear in Brady materials provided to the Network, calling into question whether prosecutors knew about those past issues or disclosed them to defendants. Two law professors said the significance of a firing in court would depend on what the officer was fired for, but detailed records of an officer’s discipline history are hidden, by law, from public view. Monmouth County Prosecutor’s Office couldn’t say if they’ve told defense attorneys about an Asbury Park cop with past issues. Before he was hired in 2001, he was fired as an Ocean County security guard, subject to one “force resignation” as a Lakewood police dispatcher, and once charged with criminal sexual contact, though the 1998 charge was dismissed, according to his employment application. At least 43 people have been arrested since 2015 by a cop whose testimony a top official in the Ocean County Prosecutor’s Office told the Network in May the office would never base a prosecution on. The prosecutor’s office argued in court in 2014 that Manchester Patrolman Ryan Saul should remain fired following internal charges including “dishonesty.” Judges took Saul’s side and put him back on duty. File photo of Prosecutor Joseph Coronato. Saul is not on desk duty. Saul is on patrol. Saul made an arrest as recently as June, according to police records. At least four people arrested by Saul have pleaded guilty in Superior Court to crimes like theft, hindering apprehension and prowling to obtain drugs, according to court documents. Ocean County Prosecutor’s officials are now in the position the office once called “untenable” in a brief to appellate judges. The office is relying on a police officer who it claimed would “undermine confidence” in the integrity of prosecutions. Saul and another officer used force to make an arrest after responding to a domestic argument in September 2010, court records show. A Manchester internal affairs report filed in court documents alleged Saul’s version of events that night didn’t match the accounts of a fellow officer and civilian witnesses. The report stated Saul claimed he was tackled by the suspect the officers arrested. Two witnesses and Saul’s fellow officer said this didn’t happen, the report shows. The report also raised other concerns with Saul’s past behavior, including an incident in which Saul “admitted that he lied…” about statements he made during a police response. Saul’s department accused him of 20 internal charges, court documents show, in part connected to his account of that arrest. Saul was examined by at least three psychologists, a court document shows. Two found him unfit for duty and one reported that he was fit to serve. The township fired Saul, then Saul challenged the firing in Superior Court. The judge acknowledged differing accounts of the arrest, but found Saul’s account to be consistent over time and consistent with his fellow officer. Superior Court Judge Mark A. Troncone, who sits in Toms River, found charges that Saul was dishonest about the arrest to be “completely without merit.” He found the township didn’t meet its burden to prove 19 of the 20 claims of wrongdoing, finding only that Saul violated the department code of conduct by not immediately reporting a knee injury he suffered during the arrest. Troncone called the three psychologists’ findings about Saul’s fitness “inconclusive” and reinstated Saul in 2014. Appellate judges upheld Troncone’s ruling. The township filed an appeal to the state Supreme Court, but settled with Saul for $190,000 in a 2016 taxpayer-funded settlement. The town agreed to leave adverse findings out of Saul’s internal file, aside from the reprimand for not reporting the knee injury. In 2017, Saul was paid more than $133,000 as a patrolman, township records show. Paris answered some of the Network’s questions, his correspondence with a reporter is available here. Manchester Police Chief Lisa Parker told the Network in a letter that Saul “is an officer currently in good standing” with the department. Should defendants know about Saul? Courts have established that prosecutors must turn over information helpful to the defense, including material on issues with a police officer’s credibility. But a prosecutor’s duty to help the defense remains a murky legal area. “Different offices will make different determinations about how far that goes,” Thomas Schmid, an assistant prosecutor in Morris County, said of Brady requirements. The Network found at least 17 county prosecutor’s offices had no policy addressing the issue, including Ocean County. The office had no records of making “Brady” notifications related to Saul. Della Fave said the office won’t tell defendants about Saul’s background going forward. “The way we read it, the court has determined he is truthful,” Della Fave said. Della Fave said in September that every case a police officer testifies in – not just Saul’s – is reviewed for anything that would impact the case. Della Fave said Saul may be called to testify in a criminal case. Corson didn’t respond to a September request for further comment. Saul’s past does qualify as material that should be turned over to defendants, according to four legal experts including two law professors and the director of training and communications for the state public defender’s office, which she estimated handles roughly 85 percent of the criminal cases in New Jersey superior courts. “Well, no one can be 100% certain in the nether world of Brady but the fact that the prosecutor thought the officer would bring disrespect on the entire department is enough for me,” Rutgers law professor George Thomas wrote in an email. While Saul’s past might not be admissible at trial, defense attorneys should know about it, according to Alex Shalom, senior staff attorney for the ACLU in New Jersey. Troubled cops stay on duty in New Jersey – even when a disclaimer on their credibility follows them to court. In two cases, conflicting authorities have left police chiefs hamstrung at taxpayer expense – stuck with cops they can’t fire but they can’t use to make arrests. Both officers earn six-figure salaries. Protecting the Shield: Bad cops are built. Here’s how. Edison Officer David Pedana remains on the job after he faced administrative charges “relating to the fact that he made numerous statements to others demonstrating racial and other bias,” according to a 2014 letter from Middlesex County Prosecutor’s Office to Edison Police Chief Thomas Bryan. The prosecutor’s office letter states the office is “compelled to dismiss any and all cases” that would rely on Pedana, the letter shows. But chief Bryan told the Network in September a departmental hearing officer determined Pedana shouldn’t be terminated from employment. Bryan wasn’t able to discuss what allegations the hearing officer sustained about Pedana’s conduct, but said in September the hearing officer did have a copy of the letter the prosecutor’s office issued about Pedana. The hearing officer determined termination was “too harsh” a penalty for Pedana’s conduct, according to Bryan. But, Bryan said, he can’t put Pedana out on the road, in a position to make an arrest. So Pedana is assigned to the records bureau and paid a $126,740 salary, pension records show. “I’m in a precarious situation…” Bryan told the Network. Bryan said he didn’t have to create a position for Pedana and Pedana does a good job. The Network used public records to identify 20 working New Jersey police officers with documented credibility issues based on requests sent to all the county prosecutor’s offices and hundreds of municipal police departments. The issues with these officers have to be disclosed when they go to court. The Network contacted the departments for each of these officers, one officer and an attorney for another said they shouldn’t be on their county prosecutor’s office Brady list. Four of those officers are still making arrests, their departments said. $133,370 – Clifton Gauthier, a Rockaway Township officer, was accused of official misconduct and witness tampering after he tried in 2012 to get a DWI ticket against his cousin dismissed. He struck a deal for pre-trial intervention that spared him a criminal conviction in exchange for 25 hours of community service and a year on probation. $101,000 – Police Chief Jacquelyn Ferentz of the West Wildwood Police Department was named on the Cape May County Prosecutor’s “Brady” list. Records provided to the Network don’t say why she’s on the list. Ferentz told the Network she had disciplinary charges dismissed, she was reinstated in good standing and she won a whistleblower lawsuitin 2017. She won a $1.7 million judgment in that suit, a court document shows. Ferentz said she should not be on the list, but in a follow-up call a captain in the prosecutor’s office said that the Brady list is accurate. 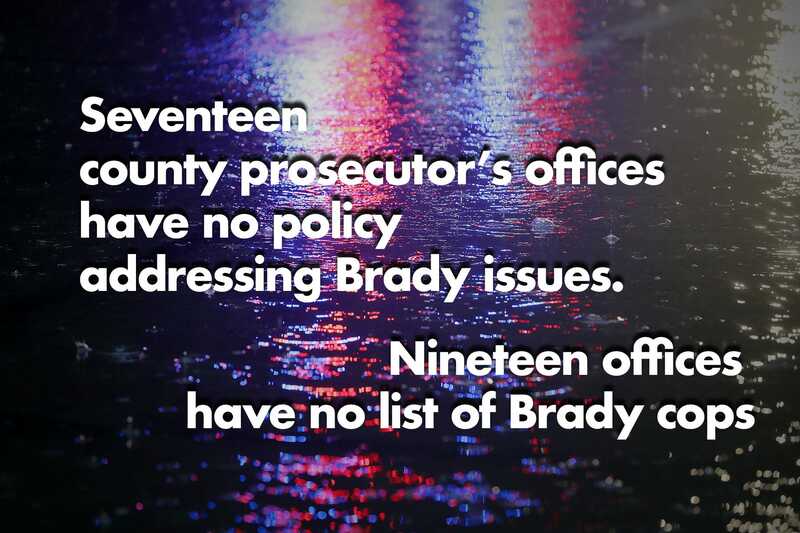 There’s no state requirement to track Brady officers with records sometimes known as “Brady lists.” Nineteen of the 21 county prosecutors didn’t have a Brady list, the Network found. The lack of record keeping on troubled officers can leave a prosecutor’s staff at a loss. Monmouth County Assistant Prosecutor Jennifer Lipp wrote in response to a records request that the prosecutor’s office didn’t make a Brady notification during her three years in her current role. Existing state policy calls for police departments to tell prosecutors about credibility issues with an officer. Prosecutors aren’t obligated to actively scrutinize the background of an arresting officer. Across New Jersey’s border, however, the Philadelphia District Attorney’s Office is proactive in keeping track of Brady records. The office is working with the city’s police department to create a database of officers whose background requires disclosure to defense attorneys, according to Patricia Cummings, supervisor for a unit in the office that examines convictions. “It goes to the very core of the integrity of our criminal justice system,” Cummings said. She said New Jersey prosecutors should track those troubled officers. Following the Network’s January investigation into gaps in New Jersey police accountability, state lawmakers moved in May to impanel a task force to review training – and the state certification process – for cops and corrections officer. In a statement Wednesday in response to the Network’s findings, Attorney General Gurbir Grewal pointed to his three directives this year, which followed Network reporting on police accountability: random drug testing for all police officers, a police early warning system, and an order to release video recordings of police using deadly force. 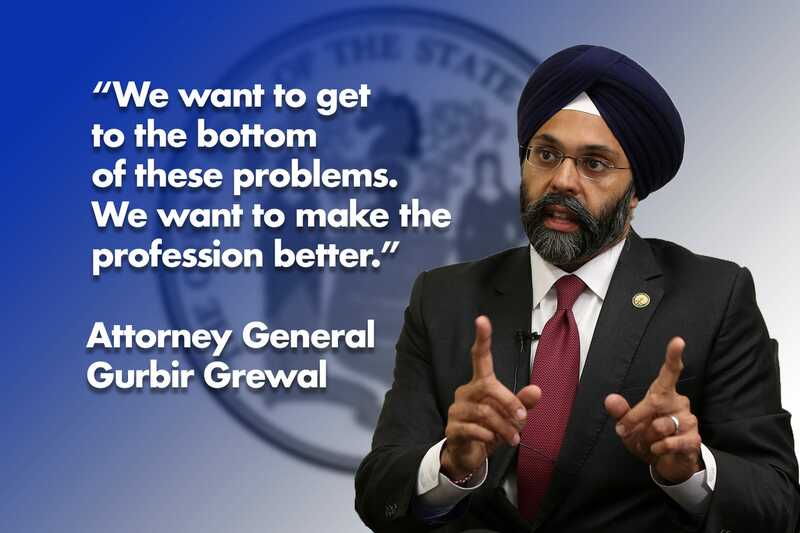 In a May interview, Grewal said his office is reviewing the state’s guidelines for police internal affairs investigations and looking at the “viability” of a statewide plan to improve Brady disclosures. But he stopped short of a licensing program. There is a secret database maintained by the state police – that was withheld in response to a 2015 request by the Network – that lists New Jersey cops who failed drug tests. Could a similar list be made of officers otherwise deemed unfit to serve? BERKELEY – The township has agreed to pay $82,500 to a legally deaf man who says he was a victim of excessive force in a 2016 arrest, when a back-and-forth he could not hear disintegrated into a physical altercation with police. Heriberto Carrasquillo, 59, of Rutherford settled with the township May 31, according to a release and settlement agreement the Asbury Park Press obtained through a public records request. The settlement closed the third of four federal excessive force lawsuits against township police that name the same former patrolman, Patrick J. Stesner. In his complaint, Carrasquillo accused Patrolmen Taylor Butler, Christopher Elliott and Stesner of punching and kneeing him and pushing his face into concrete after he led them to see several imitation firearms. Police had gone to the Berkeley home where he was staying to investigate a domestic incident. Carrasquillo claimed he could not understand the officers’ instructions and had told them so. Township police denied any wrongdoing in their responses to his complaint. The officer, Camera clarified, was Stesner. Carrasquillo’s lawsuit was the third of five federal lawsuits in less than 10 years alleging excessive force by township police. Stesner, 42, has never been a lone defendant, but he is the only officer named in as many as four lawsuits. The fifth lawsuit, which does not name Stesner, involves Berkeley police only insofar as one Berkeley officer was involved in a fatal 2016 Manchester shooting in his capacity as a member of an Ocean County Regional SWAT Team. The teams draw members from agencies throughout the county. A state investigation cleared the officers involved. You can watch video from that scene below. The first two lawsuits, from Michael Forte in 2008 and Darren Yurick in 2014, settled for $110,000 each. In a fourth, Philip Giannattasio alleged in a February complaint that Stesner and patrolmen Steven M. Kappock and Ryan J. Wahl “used excessive and unreasonable force” during a June 2016 arrest. All of the defendants have denied wrongdoing. The case is ongoing. There is video from Yurick’s encounter with police – in which he claimed officers beat him while he was in a holding cell – further down in this article. In this most recent settlement, none of the defendants — the township, township police, Chief Karin DiMichele, Butler, Elliott or Stesner — made any admission of wrongdoing, according to the agreement, which you can read at the bottom of this article. Stesner “took Mr. Carrasquillo to the ground, really banged him, banged him up pretty good for no good reason,” Carrasquillo’s attorney, Thomas J. Mallon, told the Press. Mallon, of Freehold firm Mallon & Tranger, also represented Forte and Yurick and currently represents Giannattasio. As with Carrasquillo, nobody made any admission of wrongdoing in the settlements with Forte and Yurick. Darren Yurick claims his nose was broken when he was punched by a Berkeley police officer while handcuffed has filed a federal excessive force lawsuit against the police department. The incident was captured on this surveillance video. Carrasquillo was charged with assault, aggravated assault, resisting arrest and possession of an imitation firearm at the time of the encounter, according to Carrasquillo’s 2017 civil complaint and police records. Carrasquillo resolved his charges by way of pre-trial intervention, a diversionary program that can provide a way for first-time offenders to have charges dismissed, according to his complaint. Stesner retired as of March 1, dropping a civil suit of his own in state court demanding reinstatement to active duty, a development Camera said was “in the best interests” of both the township and Stesner. Stesner had been on paid leave since around the time of a 2017 neurological examination, according to his lawsuit. At least some of the settlement will come from the township’s insurer, the Garden State Municipal Joint Insurance Fund, said Camera, but he did not have an exact breakdown on how much the township itself would have to pay. Camera said the costs of defending a civil case factor into whether the township will settle. Stesner’s salary at the time of his retirement, after approximately 15 years of service, was $110,630, according to township records. During his tenure he received praise from educators and other police agencies for his work with young people. It is unclear whether Stesner applied for a conventional retirement or a disability retirement. Police officers in New Jersey who take conventional retirement before 20 years of service receive prorated pensions, according to the state treasury department. Stesner’s personal lawyer, Robert F. Renaud, did not return a message requesting comment. Nobody returned messages at a number listed as Stesner’s. A police officer in Elizabeth, New Jersey is suspended without pay and facing the charge of simple assault after a man in custody was severely beaten. The video, which has been edited by the victim’s attorney, is violent and disturbing to watch. “I was struck in the ribs, struck in the chest, getting kneed in my face, kicked in my face, punched in my face, and I’m getting hit in areas where you have vital organs,” said Tornes. “My eye was shut closed. My lip was swollen. I had blood all over me,” he said. Raul is a DJ. He says he had never been arrested before and had a good relationship with police. But last October, Elizabeth officers showed up at his home after his girlfriend called them over a dispute. What happened next was a series of violent beatings caught on police body cams and surveillance cameras. There are other officers engaged, but no one seems to be stopping the attacks. Tornes was handcuffed throughout and is heard screaming in pain. “For him to do that with all of those cameras there is scary because it is indicative of a culture,” said the victim’s attorney Joshua McMahon. The charges were quickly dropped against Tornes but it has taken almost a year for charges to be brought against Elizabeth Police Officer Edward Shields. A grand jury on Friday indicted him on one count of simple assault. “A cop who is this dangerous, armed with a gun, making well over $100,000 a year in taxpayer money, this is not someone who should be on streets with people,” said McMahon. “I didn’t think I was going to survive because of the abuse I was taking,” said Tornes. Raul’s attorney says Officer Shields has 50 instances of using force while on the job.